Salli Driver isn't for everyone. People who have tried the Salli Driver, either love it ("Best back support I've ever used!") or hate it ("How can anyone sit on this thing?"). Either way, we can pretty much guarantee it will support you differently than any back support you have tried before. Designed in Finland by the same folks who developed the Salli Saddle Chair, the Salli Driver encourages an open-chest-with-shoulders-back posture, with an upright, balanced spine and open hip angle, similar to the healthy neutral postures experienced in a Salli Saddle Chair. This is a drastic departure from conventional back supports that envelop you in such a way that your body doesn't have to do any work. The Salli Driver does the opposite, facilitating active postural muscle activity while you sit. Is Salli Driver for you? Requires that you have a flexible upper back. If you have a very rounded and stiff upper back (i.e., thoracic kyphosis), you may find this support too aggressive. Requires that you have an average or deep low back curve (i.e., greater lumbar lordosis). If your spinal curve is quite flat in the low back area, you may find this support too aggressive. If you are over 6' tall, you may find the support raises you up so high your head bumps the roof of the car and your knees hit the underside of the dashboard. There is no side support to stabilize you if you are making hard turns in your car on a mountain road. Bucket car seats have raised ridges on each side of you to hold you in when the car makes a turn. When using the Salli Driver, you need to keep yourself centered using your own muscles. When sitting on the Salli Driver, you will feel pressures on your sitting bones (i.e., ischial tuberosities), not on the back of your thighs which is the case on traditional seats. Theoretically, this relieves pressures on the soft tissues of the thighs for improved circulation and lymph flow. Upholstered in real leather or durable knit upholstery materials. Open channel down the center of the seat provides cooling comfort and pressure relief to the genital and tailbone (coccyx) areas. Front of the seat slopes downward to relieve pressures behind the knees. 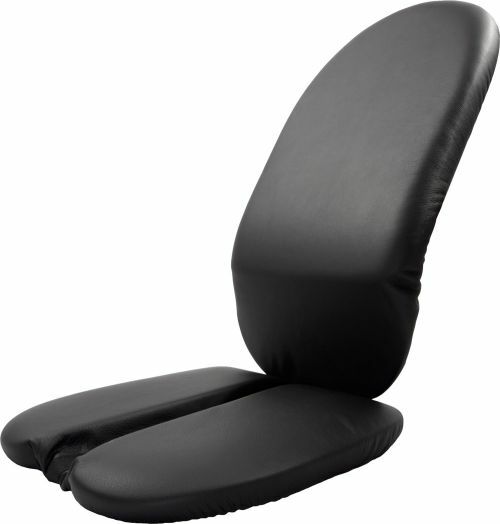 Backrest attaches securely to the seat with straps and buckles. Backrest and seat are connected with Velcro, and can be separated should you want to use the seat or back separately. Maximum body weight: 260 lbs. The manufacturer warrants this product for one year against defects in materials or workmanship which arise during the course of regular indoor use, and for normal wear of genuine leather components. The purchaser's sole claim shall be for repair or replacement, at the sole option of Salli Systems / Eaydoing Ltd., of any defective product covered by the warranty.